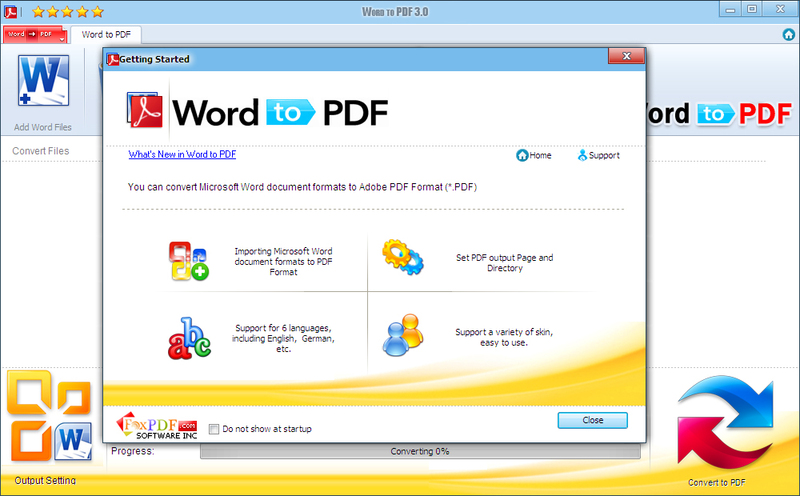 Word Doc to PDF can batch Turn any Word file into a high quality PDF that works in all PDF readers. Word Doc to PDF is the best solution for converting Word to PDF, doc to PDF, docx to pdf, rtf to pdf, text to PDF, Converting documents from Microsoft Word to PDF format gives you the ability to email documents to customers in change-protected mode, to replicate presentation materials in print shops without any troubles with missing fonts or broken layouts. Plus, converting documents from Word to PDF allows you to prepare them for archiving. Word Doc to PDF Software is the most complete solution for the conversion of word documents into Adobe PDF. 1): Easy and Suppot Any Word File Format! Word Doc to PDF is easy to use. Just click the button to canvert your PDF. 2): Preserve hyperlinks in Word to PDF conversion Most PDF conversion utilities lose your hyperlinks during the conversion. After conversion, you end up with blue underlined text, but it is not clickable. Word Doc to PDF Software preserves your links and keeps them working in the resulting PDF file. Whether they point to a web page, or internal links to a target cell in the sheet. 3): PDF Encryption Word Doc to PDF can set Two Types of Password. Two Types of Password are: Open Password (User Password) - The encrypted file will require the password to open file. Permissions Password (Owner Password) - The encrypted file will be restricted for Printing, Document Assembly, Allow Form Fill-in, Signing, Comments, Changing, Copy of content and Content Accessibility. Tool provides the options to set these permissions whether to allow or not allow. 4): Compatibility Word Doc to PDF is compatible with Microsoft Windows 2000, XP, Vista, Windows 7, Windows 8, as well as Microsoft Word 2000, Word 2003, Word 2007, Word 2010, Word 2013. Tool to combine multiple Adobe pdf documents into a single pdf file or to break large pdf into multiple smaller parts - AxpertSoft Pdf Split Merge. Program is very fast and efficient enough to process thousands of pdf files in a single hit. This site does not contain serial number, crack, keygen Word Doc to PDF serial number : serial number is the simplest type of crack. A serial number(cdkey,product key,etc) is register the program as you may already know. a crack or keygen may contain harmful software. If you cannot find the exact version you want, just give it a try. for more information read .nfo/.txt/.diz file include in zipped file.